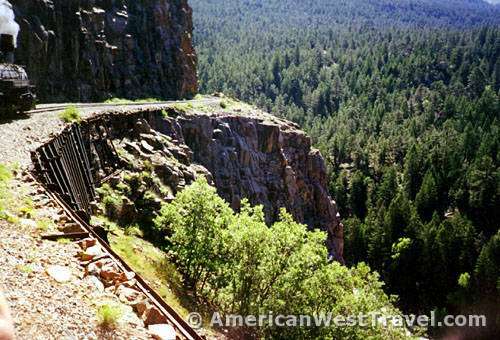 One of the American West's most scenic and historic tourist rides is on the famed Durango and Silverton Narrow Gauge Railroad. 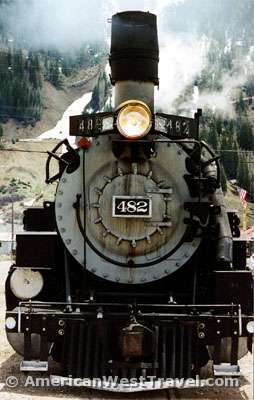 Using refurbished early equipment (dating mainly from the 1920's) including huge, coal-fired steam locomotives, the railroad ferries thousands of visitors every year from Durango (elevation 6,500 feet), up the spectacular gorge of the Animas River to the "old west" town of Silverton, Colorado, "the mining town that never quit", nestled at 9,300 feet beneath 13,000 foot peaks in the spectacular San Juan Range, the western slope of Colorado's Rocky Mountains. The line has been in continuous operation since 1882 after a major silver strike in the San Juans created a roaring boomtown in Silverton. The peak of the mining era was from 1900-1912. 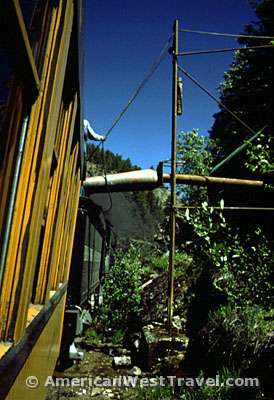 While mining has continued in the area ever since - principally gold and silver - slowing activity caused cutbacks in the railroad's schedule in the early 1950's when the line started catering to tourists. The trip has become extremely popular in recent years. 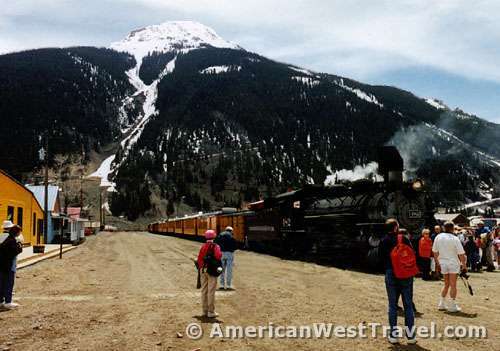 It is said that 200,000 tourists now ride the Durango and Silverton Narrow Gauge Railroad every year. 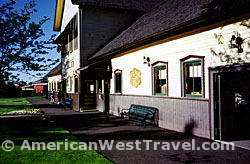 Most visitors begin their journey at the well-groomed Durango depot, [photo left]. While Durango is a small city with plenty of traffic and hustle-bustle, it also has a historic, Victorian downtown which is well worth walking through. 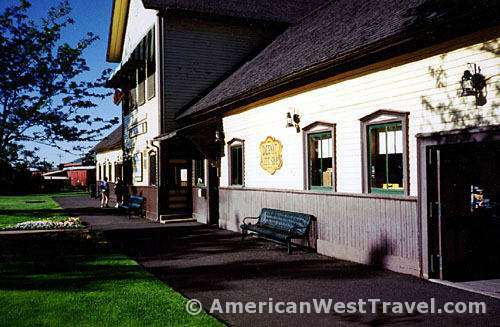 The train's destination is the more rustic Silverton depot, [photo, right]. The going is pretty slow: it takes nine hours for the train to make the roughly 100 mile round trip. Buses are provided as an alternative for the return trip to Durango. They can make the return trip on the equally spectacular "Million Dollar Highway" in about an hour. 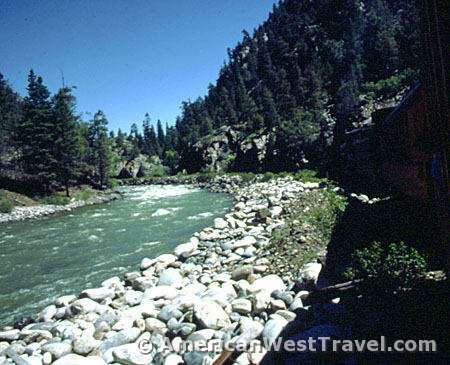 The highlight of the train ride is the gorge of the Animas River. Heading towards Silverton, the peaceful and lush valley suddenly gives way to the gorge with the train high on the cliff above the river [photo, left]. The train slowly descends to the Animas and follows the river [photo, right] most of the way to Silverton. The tracks are right next to the water. 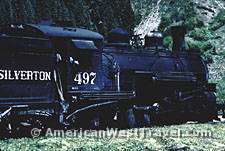 Because the locomotives are steam powered, the train must stop for a water refill about halfway to Silverton. The procedure is shown in the [photo, left]. The train requires a tremendous amount of energy to make the elevation gain to Silverton, almost 3,000 feet. If you decide to take this trip, reservations should be made well in advance especially in the summer. Try to get a car near the rear of the train. The locomotive smoke is quite strong near the front. Also, some coal soot and cinders do get blown about. 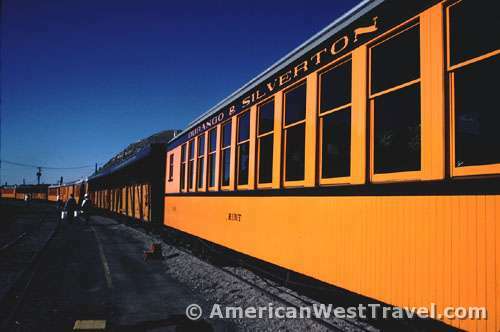 For train schedules, tickets, or more information, please visit the Durango & Silverton Narrow Gauge Railroad website or call them at (877) 872-4607. 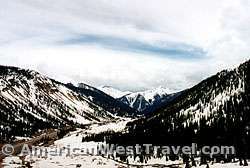 Silverton, Colorado, "the mining town that never quit"
This best-selling guidebook provides readers with more than 1,500 things to see and do in every corner of this spectacular state. 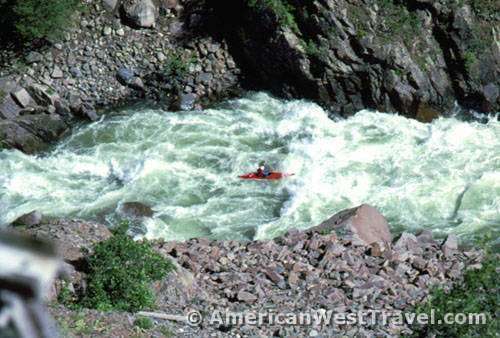 Journalist Steve Knopper grew up bushwacking the trails and hills surrounding his family's home in Boulder, and he shares his insider knowledge of Colorado with interested travelers. Discover Colorado's National Parks, ancient Native American sites, historic ghost towns, and other cultural attractions. Durango is at the junction of US-160 and US-550 (the "Million Dollar Highway") in southwest Colorado.